This scene may be familiar to older readers of the Observer in more ways than one. Stirling was at one time a brewing centre, and workplace scenes such as this must have been common in breweries like St. Ninian’s Well, Burdens and Duncan’s. 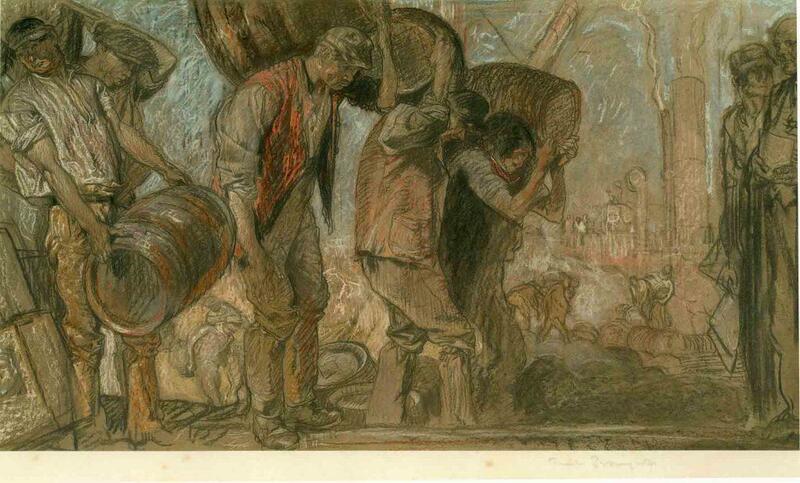 The image was sketched as part of a series of work place scenes by the eminent artist Brangwyn in 1935, and sold as a set of prints. This was in the years of the depression, when work was scarce. The set was purchased by John Jamieson Munro, the publisher who was in charge of the Stirling Observer, 1895 – 1941, and given to the Stirling Labour Exchange to hang on the wall in 1935. They remained there until the Labour Exchange in its latest form as Job Centre Plus, decided that time had moved on and that the prints should be retired to the Stirling Smith Art Gallery and Museum in 2011. The prints are not only a quality record of past working practice, but as a memorial of the donor too. J. J. Munro and the Stirling Observer were synonymous for nearly 50 years. A public spirited man, his gift to the Stirling Labour Exchange was one of his many acts of generosity which improved the cultural life of Stirling. Since his death, the J. J. Munro Trust has published over a hundred books, many of them on the history of Stirling, and his legacy in the town is a powerful one.